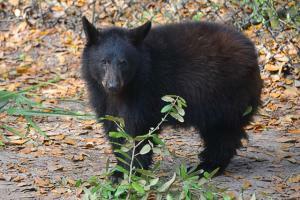 TAMPA, Fla. (December 19, 2012) – Tampa’s Lowry Park Zoo is the new home for a young American black bear found abandoned in Montana this spring. The small and spirited female has recently been introduced to the bear exhibit in the Zoo’s Mason M. and Charles P. Lykes Florida Wildlife Center, and is adjusting well to her new surroundings. The Montana Department of Fish, Wildlife & Parks retrieved the female cub in April when she was found alone and demonstrated human habituated behavior (handled by humans). She was cared for at the Wildlife Center of Montana prior to the decision to place her with Tampa’s Lowry Park Zoo this winter. Upon arrival at the Zoo in November, Blossom spent approximately 30 days in the care of the Zoo’s veterinary clinic during her quarantine period. After the black bear exhibit was baby-proofed, her animal care team began a gradual introduction to the habitat. Zoo staff has nicknamed the new bear “Blossom” after the Florida state flower, the orange blossom. She weighed 60 pounds upon arrival, and is thought to be approximately 10-11 months old (black bears are born in late-January or early-February). Wild born cubs will stay with their mother for a year and a half, and will usually den the following winter after birth, though some stay active during the winter months. Blossom’s keepers report she is cautious but curious, with a passion for climbing. Blossom will share the exhibit with adult male black bear “Sammy,” who is presently wintering in his den. The two have not yet been introduced. The zoo has housed four American black bears, including the new arrival, and provided rehabilitation for three others since 1981. Wild American black bears can be found in small pockets throughout Florida, Alaska, Canada and a few regions of the western and northeastern U.S. living in dense forests, swamps and hammocks. They are omnivores that feed on a variety of food such as acorns, nuts, berries and vegetation, as well as insects. They are primarily nocturnal and solitary animals and are considered a “threatened” species in Florida. Habitat loss is a serious threat for this subspecies that requires large areas of dense vegetation and adequate food. The black bear is the state’s largest native land mammal. Adult males in Florida normally weigh between 250-450 pounds, and adult females normally weigh between 125-250 pounds. The Florida black bear population is estimated at more than 3,000 today, compared with as few as 300 in the 1970s, according to the Florida Fish and Wildlife Conservation Commission (FWC). Tampa’s Lowry Park Zoo is operated by the Lowry Park Zoological Society, an independent 501(c)(3) charitable organization committed to excellence in education, conservation and research. Tampa’s Lowry Park Zoo is accredited by the Association of Zoos and Aquariums (AZA), and has been named the No. 1 zoo in America by both Parents magazine (2009) and Child magazine (2004). The Zoo is located at 1101 W. Sligh Avenue in Tampa, one mile west of I-275 (exit 48) and is open seven days a week, from 9:30 a.m. to 5 p.m. daily, with extended hours on select nights during special events. Parking is free. For more information, visit LowryParkZoo.com. Also find the Zoo on Facebook. Images by David Parkinson, Zoo docent.